Just a short one, I've been busy packing and checking gear all afternoon, I've got a ship shift at 8pm, then another sailing at 2am, so it's going to be a disrupted night. Weather? The forecast is changing significantly. The one they use for the windfarms has been changed in the last few hours, it's a particularly good one as they have to forecast when and where to send all the ships and as it costs many thousands of pounds a day to hire the ships, and they have to work in extreme tolerances when lifting and carrying 800 tonne sections, then there's not much room for error. The latest, from this afternoon, is much different to the last one from Sunday. Wind is at sea level, possibly up to force 7 or gale force 8. 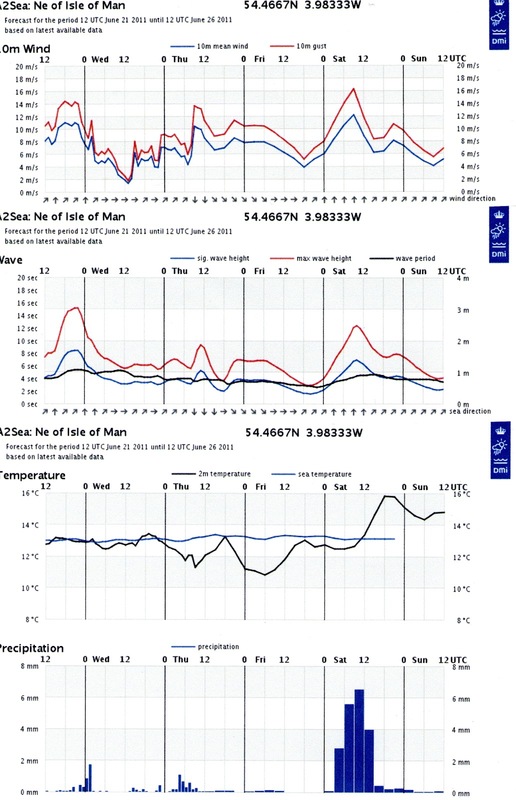 As you can see, Saturday morning has been filled with south westerly winds and a considerable amount of rain, a quarter of an inch before noon, easing from early afternoon to become showery and much warmer, although at a maximum of 15 to 16 deg C at 3pm, then not as warm as last years 22 deg C most of us experienced. This change in the forecast is because the high pressure area expected to give us the cool and dry weather predicted earlier has indicated it's moving off to the south letting wet and windy weather onto the Island, London and the south east is now expected to be cool and dry. Still, 4 days to go and things could still change. At the moment these forecasts are used up to 2 days in advance so fingers crossed. ﻿ ....although looking at this, I'd be careful if you're playing golf on high ground tomorrow! Hopefully this will change, you can be sure I'll keep an eye on it. If you're making final preparations though, an extra check on the wet gear wouldn't hurt.